Explore map of Missouri, the 21st largest, and the 18th most populous of the 50 states of US, it is known for its lakes, state parks and a host of cultural attractions. The state has 114 counties and the independent city of St. Louis, its capital city is Jefferson City. Missouri was admitted into the union as the 24th state on 10th August, 1821.
: Looking for an accurate location of a particular destination may at times be tough but at mapsofworld it becomes easy. For instance, our Map of Missouri would give you the minutest of details that you are looking for in a map such as tourist attractions, airports and rail lines, hospitals, museums, resorts, and others. Highly accurate and prepared with utmost care, the map is ideal for everyone, especially if you are a student, teacher geographer or a traveler. The official flag of Missouri was designed by Marie Elizabeth Watkins Oliver and was adopted in 1913. The flag consists of three horizontal stripes of red, white and blue with the seal of Missouri on top of the stripes. Missouri is situated in Midwestern United States. The 21st largest state in the United States, Missouri has 114 counties and the independent city of St. Louis. It is the 18th most populous state of the country and has a population of 6,083,672 as per the 2015 estimate. 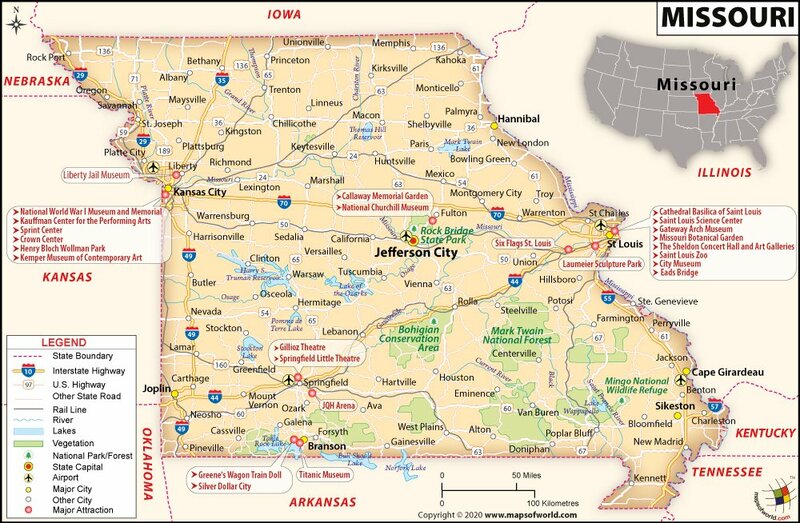 Jefferson City is the capital of Missouri while its largest city is Kansas City. Missouri is also referred as 'the show-me state', which is its unofficial nickname. Missouri had been inhabited by indigenous people for many centuries. The region came into contact with Europeans in the later part of the 17th century when the two French explorers Jacques Marquette and Louis Jolliet descended the Mississippi River. This was followed by other French explorers. Following the defeat of the French in the French and Indian Wars, the French secretly handed over the territory situated west of the Mississippi to Spain. In 1800, the Louisiana Territory, which also comprised Missouri, was ceded back to France. Shortly thereafter in 1803, as a part of the Louisiana Purchase, the territory was given to the US. In 1861, following the secession of the Southern states, Missouri decided to remain with the Union. Missouri witnessed rapid development in the period between the Civil War and the End of the WW2. During this period the economy transitioned from a rural one into a hybrid industrial-service-agricultural economy. Today it is a highly developed state. Missouri is spread over an area of 69,704 square miles. Missouri shares its borders with Illinois, Kentucky, Tennessee, Arkansas, Oklahoma, Kansas, and Nebraska. Taum Sauk Mountain, at a height of 1,772 feet, is the highest point in the state. Some prominent rivers of the state are Mississippi River, Missouri River, Black River, Roaring River and Current River to name a few. Some famous mountains are Taum Sauk Mountain, Hughes Mountain, Pilot Knob and Wildcat Mountain. Some mammals found in the state include silver-haired bat, muskrat, Raccoon, striped skunk, and American Mink to name a few and some birds are Canada goose, American Kestrel, wild turkey among others. There are certain destinations in Missouri that you should check out such as the St Louis Gateway Arch, which is the symbolic Gateway to the West. Branson is located in the southwest part of the state and is referred as the "Live country music capital of the universe". Nelson-Atkins Museum of Art is home to an impressive collection of pieces from around the world. Other than these you can also visit Silver Dollar City, Forest Park, Wilson's Creek National Battlefield, and Mark Twain Boyhood Home and Museum to name a few. The two main airport hubs of Missouri are Kansas City International Airport and Lambert–St. Louis International Airport. Some cities which Amtrak connects are Jefferson City, Kansas City, St. Louis, Independence, Poplar Bluff, Washington, La Plata, and others. MetroLink is an urban light rail which connects St Louis with suburbs in Illinois and St Louis County. Intercity bus service in the state is provided by Trailways and Greyhound. Some prominent interstate highways are I-29, 1-35, I-44, 1-49, and I-55 to name a few. Some prominent universities in the state include University of Missouri, Washington University in St. Louis, Missouri State University, University of Central Missouri, Northwest Missouri State University, among others. Since Missouri is one of the leading dairy producers of the US, it is also known as America's Dairyland. It was admitted to the Union as the 30th state on May 29, 1848.